Greetings from Chile! I am writing this as I sit in the Santiago airport waiting to board my plane for home. Some of you have e-mailed asking me where I’ve been hiding, only to be met with a response from Outlook saying that I’ll be out of the US with limited access to e-mail and voice mail. I left home on Monday, September 24th for an internal company event I hosted in Dallas. Three days later, I boarded a plane to return to Rapa Nui, a.k.a Easter Island. While I can’t say much now about the three weeks I spent on the island, I can tell you that you will be hearing a lot more about my trip in the coming months. This trip sets a new record for me. I will have been away from home for 26 straight days, almost four weeks. It is sure going to be nice to sleep in my own bed again! All weekend, I’ll be doing laundry, catching up on my e-mail, and watching the Red Sox. Iorana (thank you) to my dear friends Sonia, Sebastian, Tahira, Melinca and Geraldine in Rapa Nui! Since this is my final posting on my visit to Kosrae , I thought I would answer a few questions about it. How does one get to Kosrae? A good question! With flights from either Hawaii or Guam, Continental Airlines is the best way to get there. KSA is the Kosrae airport code. The cool part is you get to island hop to other islands on the way: Chuuk (Truk), Pohnpei, Kwajalein, and Majuro. I came in from the west (Guam) and left heading east so I landed on all of them. I stayed at the Kosrae Village Resort. The resort provided me with a thatch and bamboo hut, mosquito nets, and great food. It’s a real off the beaten path kind of place that leaves little to no carbon footprint on Kosrae. If you prefer concrete, air-conditioning, etc., they can accommodate you as well. I was on a strict budget, so I opted to rough it out in the jungle by the shore—bugs, land crabs, and all. It was great! What should I bring to Kosrae? 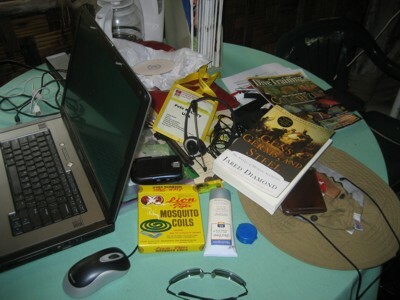 This photo of the table in my hut pretty much answers that question: good book, mosquito coils, laptop, sun block, hat, sunglasses, camera…and in my case, Civil 3D 2008! VIDEO – A few thoughts from me on my last day on Kosrae. The Yela Watershed on Kosrae is reputed to be one of the last, undisturbed watersheds in the world. Yela is a great example of yet another resource unique to Kosrae that needs to be mapped and modeled so that a baseline may be established for further study, analysis, etc. Yela has already been the subject of many USFS, USGS, and Nature Conservancy studies. Rightly so. To see it, even from offshore, made me think of Jurassic Park. It is the thickest, densest, greenest, forested area of land I have seen. From its highest point right down to the sea, Yela is undisturbed by any roads, utilities, culverts, etc. A rare place to be sure! Because of the rarity of this site, the US Forest Service has been studying and surveying in the area for years. If you are curious to know more, simply enter Yela Watershed into a search engine—a lot of information is available. Boaters, fishermen, and divers can tie up to the buoy rather than using an anchor, which can damage the reef below. Provides a fixed—well sort of fixed—location that can be used with GPS and mapped with (you guessed it!) Civil 3D. The buoy locations are then linked to Access databases that are kept up to date with information about the health, size, and locations of the coral heads below. 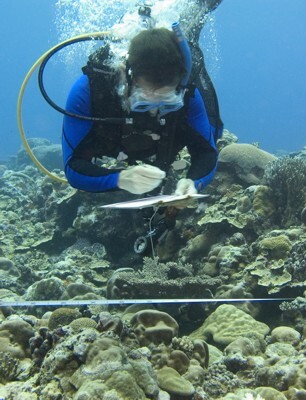 The tricky part is locating the coral heads by using the buoy as a fixed point. This is done with a tape, a compass, grease pencils, and scuba gear. Do you remember sitting in trigonometry class wondering when the heck you would ever need this knowledge? With GPS, CAD, etc., who needs to know trigonometry when the technology does it all for us? 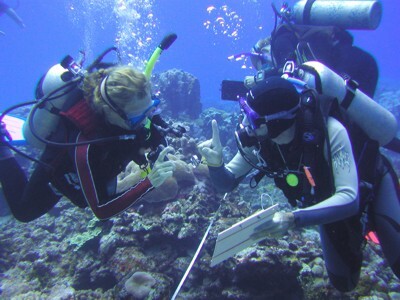 Coral reef monitoring is a great example of why you should pay attention in trigonometry class! No technology here—just hard work and a much-needed wake up call for this author. I have modeled many sites, both above and below ground, with Land Desktop and Civil 3D in my day, but modeling coral reef heads that live 40 feet underwater was a first! The only bad part was that I broke two toes on my left foot while I was trying to get photos of a pod of about 50 dolphins that suddenly appeared near the boat. In a six foot swell, I stood up, grabbed my camera, and ran for the bow to try to get a shot. About the time I got to the bow, the boat dropped down into a hole, came up on the next wave suddenly, and launched me about six feet into the air. I landed on my tailbone (ouch! ), was thrown up in the air again, and landed on my left foot. Too bad I did not get video of that! My thanks to The Kosrae Village Resort for the photos and the dive gear! Until this past week, I had never surveyed a cave or a coral reef. No GPS here on Kosrae—I actually had to remember some of my trigonometry from years ago. Fortunately, I had lots of help and, in truth, others did the math for me! 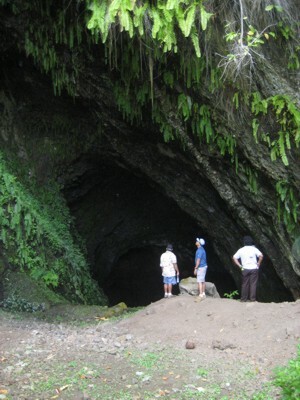 Like Lelu Island, Bird Cave is another historical site on Kosrae. This cave is aptly named, since it is indeed a cave full of swiftlets, birds whose guano has been gathered at the cave for centuries. The government team was eager to show me this site, since it is clearly one that future tourists would pay to experience. Because of its close proximity to the coast and its long archeological history, our challenge was to map the site before the tourists come to see it. I’m relieved to say that the landowner and his family were happy to see us. You see, I’ve been chased off of private land before—even shot at. Some landowners get very nervous or upset when the government shows up with lots of strangers and equipment. Their hospitality was truly inspiring... although it did take me a few moments to see past the large machete he would not put down! I’ll write about my experiences on the reef in my next post. VIDEO - A few thoughts at the end of the day. 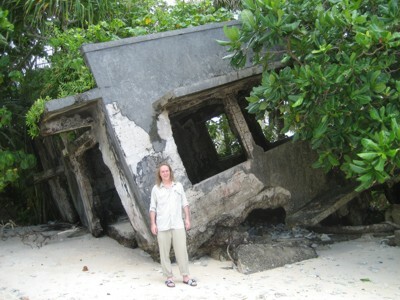 At this site on Kosrae in 1942, a US submarine put ashore a lone commando whose mission was to obtain the Japanese code book used at the radio station. By blowing up a nearby fuel depot, the commando created a diversion that enabled him to enter the station, grab the code book, and escape back across the reef and out to the waiting submarine. 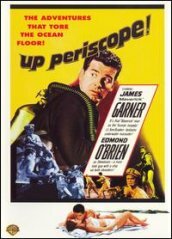 This remarkable story was later made into the 1959 Hollywood film, Up Periscope! Towards the end of the war, the Japanese blew up the station so that it would not fall into US hands. My students and I chose this site to conduct the field portion of the survey training so the Kosrae historic preservation team could have the resulting model when we were finished. We also located positions for a LIDAR scan scheduled to happen later in the week. The class went very well and the students were impressed with Civil 3D’s Figures and Description Keys functionality. On my blog, I have posted several photos of the remains of the station and the class in the field. VIDEO Berlin Sigrah, the Kosrae Historic Preservation Officer tells a little bit about the local villagers and their struggle during the war in this video. VIDEO On the beach at the radio station Simpson Abraham, Director of the Kosrae Island Resource Management Agency, discusses the other problem that Kosrae is facing: shoreline erosion. 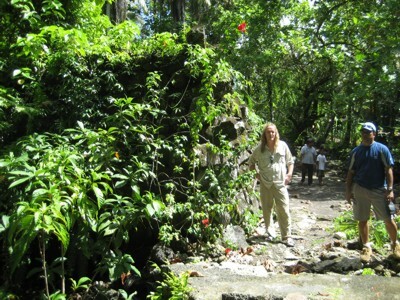 During my visit to Kosrae, I had the pleasure of touring the Lelu ruins. They showed me this site because it is very high on KSAM’s list to survey, map, model, and ultimately preserve. 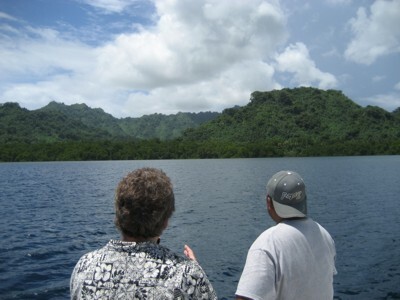 Lelu is actually a man-made island located at the entrance to Kosrae’s main harbor. Constructed some 1500 years ago Lelu represents a magnificent example of prehistoric, Polynesian engineering. The Lelu ruins consist of very high walls, canals and thoroughfares, and tombs of dead kings. Kosrae is the greenest place I have ever seen. There are plants of every size and type all over. My photos may give you some idea of the kind of overgrowth that needs to be cleared as an early first step. My hosts told me that the site had been recently cleared! It seems that within about 30 days, life takes hold again and the site is all but hidden by the dense overgrowth. Due to time constraints, we were unable to survey Lelu—it is a BIG place, and is far larger than I imagined. The government’s hope is to survey not only the ruins but the modern housing that surrounds the ruins on all sides. An accurate map is needed to create a GIS,which will aid the local government in its plans to make the Lelu ruins accessible to tourists, and profitable to the locals who live nearby. 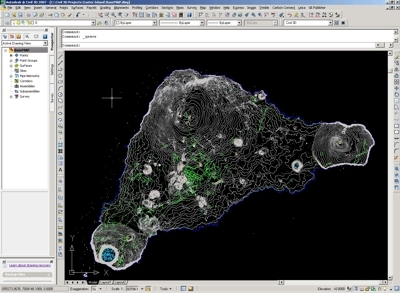 An existing plat map (created with Land Desktop, and now correlated with Civil 3D 2008) that displays all of the cadastral data on the island will be combined with the 3D model I helped the students create. Now with the addition of 3D, the islanders will be able to monitor and report on drainage, erosion, and coral reef growth, not to mention the design of landfills, roads, docks, etc. VIDEO – Here I talk a bit about the survey class that is about to start on Kosrae. Warning, I’m jet-lagged in this one! 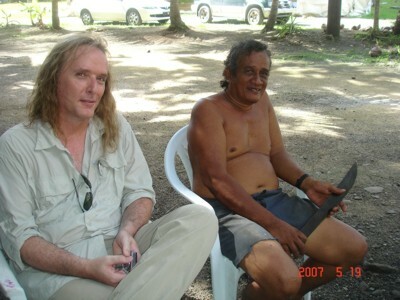 On Wednesday, May 16th, I arrived on the island of Kosrae. Known as the Island of the Sleeping Lady, Kosrae is one of the four states that makes up the Federated States of Micronesia, and let me tell you, it is a stunning place. I have never seen such pristine, natural beauty like this anywhere. Download this KMZ file to locate/view Kosrae with Google Earth. I was invited to the island to meet with the Governor, as well as many state and local government department heads, to discuss how Autodesk technology can help sustain, preserve, and protect Kosrae (pronounced Ko-shry). These visionary people understand that Kosrae is virtually untouched by Western influences, that it’s terrestrial and marine beauty is unrivaled, and that it is vulnerable. The islanders want tourists, diving magazines, the Discovery Channel, etc. to discover Kosrae, but they understand that proactive planning will make the eventual onslaught of tourists manageable, profitable, and sustainable. This situation reminds me of what I found on Easter Island, but with one big difference–with regard to tourism, Easter Island is in a reactive situation. On Easter Island, a Boeing 767 loaded with tourists arrives several times a week. The island is struggling to meet the demands made to their infrastructure and the natural environment. 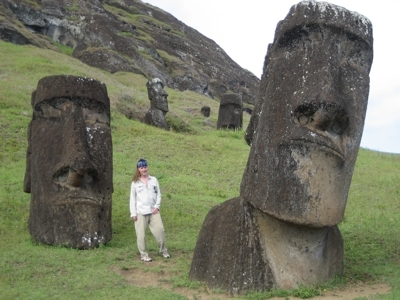 By the way, my work with the Easter Islanders continues . . . more about this later on in the fall. On Kosrae, we created the Kosrae Sustainable Asset Management Project (KSAM), a new committee that brings together the stakeholders from government, land management, public works, marine resources, survey and mapping, historic preservation, and tourism. Acting as a single unit, adopting one standard, and working toward the ultimate goals of preservation, sustainable design, and private development, this group will create processes, procedures—and maybe even laws—that will welcome tourism, but manage it wisely to preserve their magnificent island. 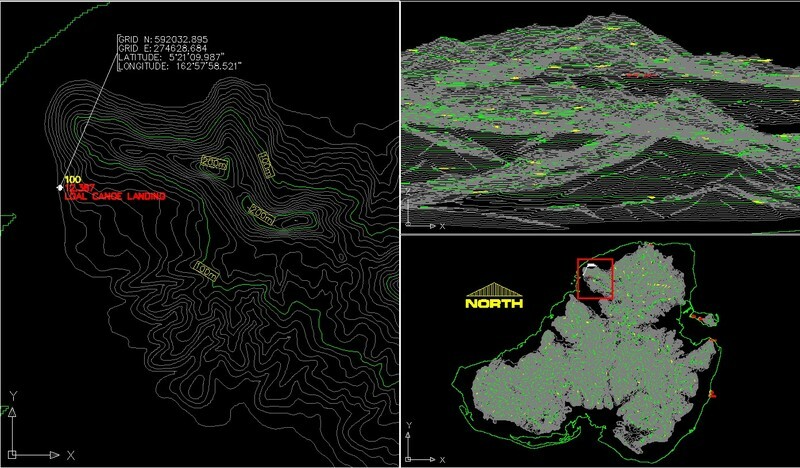 I was fortunate to visit, survey, and map several unique sites on Kosrae, including prehistoric ruins, World War II sites, and even an underwater survey—all completed with AutoCAD Civil 3D 2008. Look for my posts (some with video) about them in the near future. I travel a lot and I am often asked, “What is your favorite destination?” For many years, I’ve answered with “Alaska” and “Switzerland”. Last week I visited Rapa Nui, and it is the most incredible place I have ever seen. The island, a part of Chile, has many names: Isla de Pascua to the Chileans, Easter Island to most Americans, and Rapa Nui to the native people. It is a LONG way from anywhere! Download rapa_nui.kmz for viewing with Google Earth. Located roughly halfway between Tahiti and Chile, Rapa Nui is the most isolated inhabited island on earth. Most famous for its moai statues, the island also has a fascinating history, the friendliest people, great food, and a lot of mystery. There are many theories about how the moai were made and then transported to their present locations, why many of the moai were knocked down, the cannibalism that occurred on the island, and what happened to the native population. My wife Pam and I decided to visit the island because I was going to be in Santiago, Chile visiting customers and business partners. Originally planned as a vacation, our visit to Rapa Nui quickly became a working holiday. Prior to leaving for the island, I assumed that the islanders must have a need for surveying and mapping technologies. After doing a bit of Internet research and having several phone conversations with surveyors and archeologists who had visited the island, I was put in touch with the Chilean government archaeologist on Rapa Nui. My hunch was right and we were welcomed with sincere enthusiasm. With the blessing of the Chilean government and the generosity of the good folks at Trimble, I left for the island with GPS field gear and Civil 3D. We surveyed for three of the five days we were on the island. It was quite simply the best three days of my life. We were granted permission to walk on the ahu, something that is absolutely forbidden to everyone else. 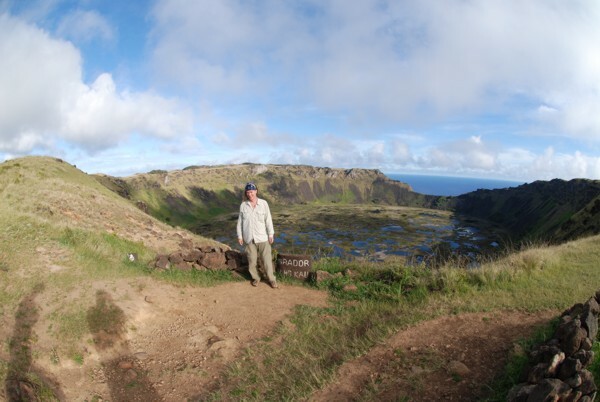 We spent one day out on Motu Iti, one of the small islands to the southwest of Rapa Nui. Again, the Motu are off-limits to tourists and locals alike. We saw 1000- year-old tool making sites and human remains, bird colonies, amazing volcanic geology. . . I could go on and on. We surveyed it all and then I spent time in my hotel room making 3D models out of the data we gathered and existing data the government provided. The one thought that never left me while on Rapa Nui was that this unique place must be preserved. The island is the world’s largest open-air park. As such there are not many fences and too few officials to make sure the tourists behave themselves. I will be making several more posts about this trip and I will be returning to Rapa Nui to gather more data and to train the government officials on Civil 3D. I have also been invited to join with the Chilean government in presenting our data to a large gathering of academics and researchers this coming August in Sweden. My sincere thanks to the Rapa Nuians, the Chilean government, and to Trimble for making this trip such a great success! View my photos of Rapa Nui. I traveled to Santiago, Chile this week to visit and train several Civil 3D customers and partners. This is my first time in Chile, and I have to say I like it a lot. The people, the place and the food are all outstanding. The nice folks from IEG were quite skilled with Civil 3D, so we all learned a lot from each other. Thanks to Mauricio Estay and the staff of Comgrap and my new friend and fellow Autodesk-er Cristina Randazzo. My Spanish is so bad that I think I may have been telling the group that “the cattle are plaid” instead of Civil 3D rocks! They have been very patient with me. IEG and Comgrap staff (at left), Cristina and I (at right) looking relieved that we did not blow up! Around lunchtime today, I heard a commotion outside of Comgrap’s facility. As it turned out, the contractors working in a trench there accidentally hit a high-pressure gas line with their backhoe. We evacuated the building and not 50 yards from us was a very loud, very high geyser of natural gas shooting out of a ditch. Luckily, no one was smoking or we would have been toast! The gas company has no GIS system, so it took some time for them to locate the nearest shutoff valve. Being an evangelist, I have already contacted the gas company to ask if I can demo MAP and MapGuide to them while I am here! If ever there were a real world example of need, this was it. I have another two weeks in South America. I can’t wait to see what happens next!